Stunning Hand-Painted and Drawn sketch cover art featuring Harley Quinn in her classic look, by THRILLKILLER artist Dan Brereton. Mixed Media: Ink, Watercolor and Goauche. Dan and writer Howard Chaykin introduced readers to an Elseworlds version of the character in 1998, before her debut in the regular DCU. This is the only Harley we know of by this artist on a sketch cover. 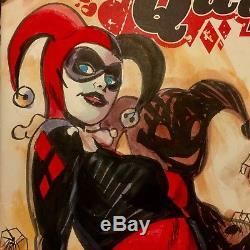 The item "HARLEY QUINN Painted by DAN BRERETON Comic Sketch Cover ORIGINAL ART" is in sale since Thursday, February 15, 2018. This item is in the category "Collectibles\Comics\Original Comic Art\Drawings, Sketches". The seller is "volcanus" and is located in Lincoln, California. This item can be shipped worldwide.